Figure 2: Overview of the Lux signaling system. 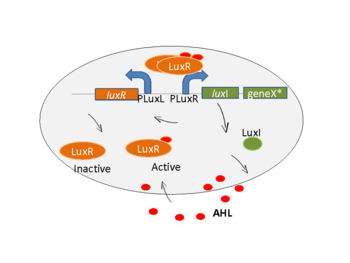 With no LuxR-AHL complex bound, PLuxL enables transcription of luxR whereas PLuxR is shut off except for slight expression of the downstream operon. If AHL concentration rises inside the cell, PLuxL is shut down and PLuxR induced, yielding high expression of LuxI and thus further increase in AHL concentration, constituting positive feedback. *Placeholder downstream gene. The Lux signaling system is based on positive feedback. 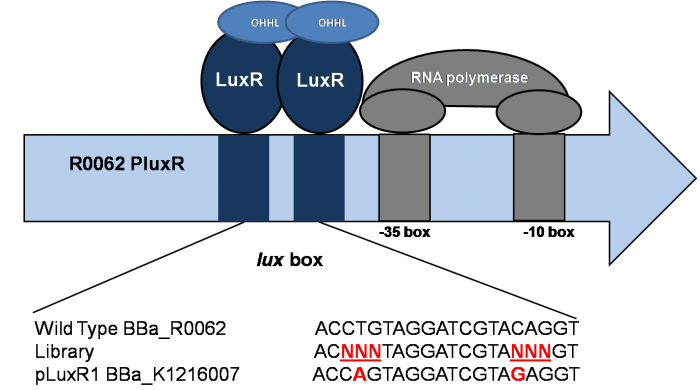 The PLuxL promoter drives expression of the upstream luxR gene. The promoter PLuxR driver expression of the downstream operon including the LuxI AHL synthetase. The promoter encompasses a palindromic operator sequence to which a dimer of LuxR-AHL complexes binds to induce transcription. In absence of this complex, PLuxL is active and thus LuxR is abundant. PLuxR however is inactive, showing slight leakage, yielding a fairly low expression level of LuxI and other downstream gene products. An important feature of AHL, the "signaling molecule" of the system, is that it diffuses freely through cell walls and surrounding media. This enables communication between cells in vincinity. 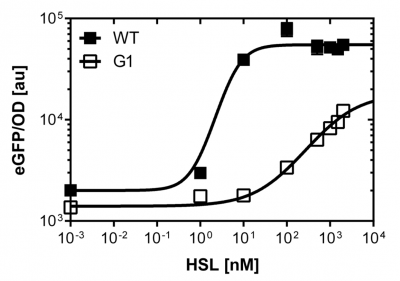 When a certain cell concentration is reached, the diffusing AHL yields sufficiently high levels of the LuxR-AHL complex within cells. The direct consequence of this is high expression of downstream genes, importantly inculding LuxI (and not so importantly shutting down PLuxL). Now the positive feedback loop is being closed by elevated synthesis of AHL which further increases LuxI synthesis in cells. In V. Fischeri other downstream genes include a luciferase which is part of a symbiosis with marine animals. Other possibilities are proteins that facilitate biofilm formation and related phenomena. In (synthetic) biology, this system can be used as a sender/reporter system by separating LuxI and LuxR, where LuxI is not under control of PLuxR, rendering the system independent of cell concentration. LuxR/PLuxR can then be used to drive expression of a myriad of other genes such as various reporter genes. The final construct was sequenced. 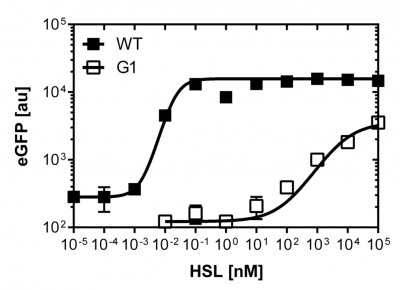 Our goal was to achieve mutations in the luxbox of the pLuxR BBa_R0062 promoter to shift the dose response curve of the promoter depending on the OHHL (3-oxo-hexanoyl-l-homoserine-l-lactone) concentration. Figure 3. Sensitivity curve of the wild type promoter and pluxR variant (G1) analyzed on the Tecan M200 Infinity plate reader. The OHHL concentration range is plotted against the standarized fluorescence (au). Fore The G1 mutant : EC50=1'341 nM, R2= 0.98,n=0. All assays were carried out in triplicates, results are presented as mean ± standard deviation. The eGFP reporter allows us to make fluorescence measurement in plate reader experiments as well as in single cell analysis to characterize the promoter behavior depending on [OHHL], by recording the fluorescence [au]. According to literature (Geske G.D. Evaluation of a focused library of N-aryl L-homoserine lactones reveals a new set of potent quorum sensing modulators) we could define the first experimental OHHL ranges to induce the promoter. After some fine tunning and adjusting experiment we could narrow down the ranges to obtain a dose response curve in a reasonable resolution for the BBa_R0062 wild type promoter to the OHHL (3-oxo-hexanoyl-l-homoserine-lactone) concentration. See Figure 3. these data were obtained from a plate reader experiment. According to the sensitivity range of the wild type promoter we could screen for promoters, and scan the potentially shifted sensitivity variants in different ranges of [OHHL]. We finally isolated one promoter variant which shows a shift in sensitivity compared to the wild type. See G1 on Figure 1. The pluxR variant has an EC50=1'341 nM , the pluxR wild type has an EC50=5.86 nM according to the plate reader data. The single cell analysis gave us data of higher quality (see below). To obtain high quality data we did single cell analysis over the range defined above. As expected the EC50 change compared to the microtiter plate data. 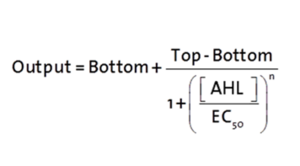 Figure 4. 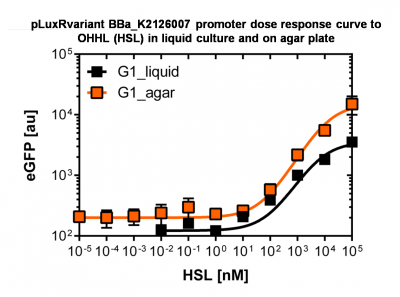 Dose response comparison between [OHHL] induction in liquid culture and on agar plates, of the BBa_J09855 construct using the pluxR variant BBa_K1216007 promoter and a eGFP gene as reporter</b> analyzed at different [OHHL] in the single cell analysis. The black curve shows the response of to OHHL in liquid culture, the orange curve shows the response to OHHL on agar plates. All assays were carried out in duplicates, results are presented as mean ± standard deviation. For the agar plates we got :EC50=12'555nM, R2=0.93, n=0.8. All assays were carried out in duplicates, results are presented as mean ± standard deviation. 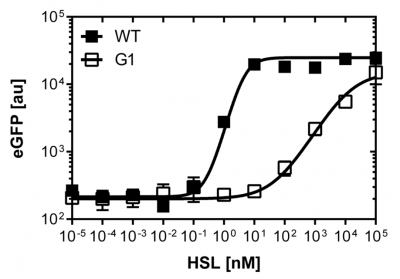 Figure 5 shows the dose reponse curve of the promoter depending on OHHL concentration. We performed this experiment in liquid culture as well as in agar plates (OHHL was added to the melted 1.5% agar), which was closer to our project. We observed a shift in the dose response between the liquid culture (EC50=6'482 nM) single cell analysis and the one in agar plates(EC50=12'555 nM).This correspond to a 2 fold shift. For the pluxR variant we got: EC50=12'555 nM, R2=0.93, n=0.8. All assays were carried out in duplicates, results are presented as mean ± standard deviation. For the pLuxR variant we got: EC50=6'462 nM, R2=0.97, n=0.8. All assays were carried out in duplicates, results are presented as mean ± standard deviation.